Spring Opara is a project director for CompassPoint. As a project director, Spring leads (or co-lead) several kinds of offerings for CompassPoint program participants, including cohort leadership programs, consulting engagements, and public workshops. She also plays key program design, project management, and facilitation roles within CompassPoint's highly collaborative project teams. 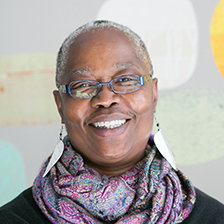 She is a core team member of the HIVE (Healing, Inspiration, Voice and Equity) Leadership Development Program, a cohort program for reproductive justice leaders in Louisiana. Spring has created a leading edge health, wellness, and self-care curriculum for Black women in leadership, which she delivers for CompassPoint through our public training workshops and cohort leadership programming. Spring is passionate about self-directed development and holds a coaching certificate from Leadership That Works in professional and personal coaching, which she uses extensively in support of her colleagues and CompassPoint’s participants. She has worked for several nonprofits in the Bay Area including WestEd, The Toigo Foundation, The Dental Health Foundation, and The Link to Children (TLC), all of which have allowed her to develop a plethora of skills and opportunities to support work that has a positive impact in her community.